IRPRESUNIV.ORG, CIKARANG – After weeks of preparation, uncertain weather and busy schedules, the annual International Relations Cup of the year 2019 has finally come to an end. From Batch 2016 to Batch 2018, including guests which consisted of upperclassmen and lecturers had attended the competitions with motivation of becoming the champion. 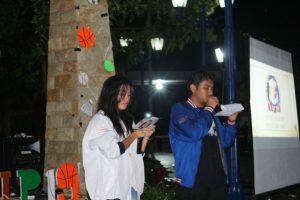 The tagline for the anticipated event was “Retain the Honor, Compete with Dignity” giving off the message to bring back the motivation and enthusiasm from last year, but also to play with respect and sportsmanship. The International Relations Cup began on January 14th, and had the same branches of sports as last year, consisting of: Relay Race, PES, Badminton, Tug of War, Basketball, Futsal, and Volleyball, and a new competition was added, which was Billiard. All participants were enthusiastic to participate in all 8 categories, despite the weather being inconsistent, the motivation and eagerness from the players kept the atmosphere light and warm. The closing ceremony was held on February 11th, along with the announcements of the champions, there was a dance performance by Japan 6 2018, singing performances from Faisal Rabbani of Diplomacy 4 2017, Dwita Sidangoli of Japan 6 2018, and Bayu Andaresta of French 1 2018. The champions of the games are as following… The champions of the Relay Race were French 4 2018 as the first winner, followed by Diplomacy 4 2017 as the second winner, and then Diplomacy 3 2017 took the third place. From PES, the first winner was Guest, second winner was taken by Japan 6 2018, and lastly, French 4 2018 as the third winner. The winners from the new branch of Billiard were Diplomacy 1 2016 as the first winner, Diplomacy 3 2017 in second place, and Diplomacy 4 2017 as the third winner. Proceeding onto Badminton; from the Male Category, the first winner was Guest, followed by French 1 2018 in second, and Japan 5 2018 in third place. For Female Category, Diplomacy 2 2016 obtained the first place, with Guest as second place and French 2 2018 followed behind in third place. In the Double Mix Category, the winners were Diplomacy 1 2017, Diplomacy 3 2017, and Diplomacy 2 2017. In Tug of War, the winners were obtained by French 4 2018, Japan 6 2018 and French 1 2018. In Basketball: Female, Japan 5 2018 obtained the first place, followed by Diplomacy 2 2017 and Diplomacy 3 2017. For the Male Category, Guest obtained the first-place spot, with Diplomacy 3 2016 and Diplomacy 2 2017 for second and third place. Guest had also become the first winner in Futsal: Male, Defense 2016 in second place, and Diplomacy 2 2017 in third. For Futsal: Female, the winners were Diplomacy 4 2017, Japan 5 2018, and Diplomacy 2 2017. In the final competition, which was Volleyball, Guest had once again received first place, followed by French 1 2018 in second, and Diplomacy 2 2017 in third place. From all of the competitions that have been held for this year’s International Relations Cup, Best Supporter went to French 4 2018, and the General Winner was Guest. Congratulations to all the winners. The event not only helped with finding great athletes, but also strengthened the relationship within the International Relations students.